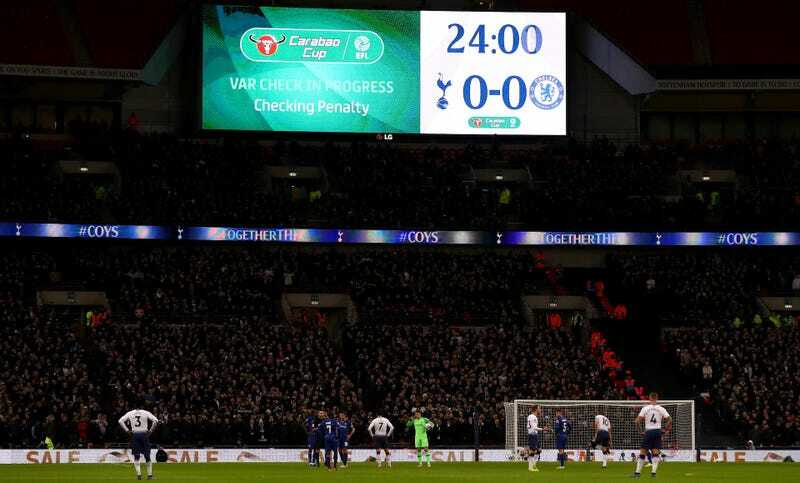 Tottenham beat Chelsea in the first leg of their League Cup semifinal tie yesterday by a score of 1-0 thanks to a video replay-awarded penalty decision that was so comprehensively terrible that it had both managers trashing VAR after the match. The play started when Spurs defender Toby Alderweireld raked a long pass over the entire Chelsea team into the path of an onrushing Harry Kane. As Alderweireld’s pass neared them, both Kane and teammate Dele Alli found themselves sprinting into wide open space, completely unmarked, with the beaten Chelsea defenders only half-heartedly pursuing them while raising their hands and glancing over at the line judge, clearly believing Kane to be offside. Indeed, the line judge had in fact deemed Kane offside and stood there with his flag raised. Still, Kane, Alli, and Chelsea goalkeeper Kepa Arrizabalaga continued with the play, and when Kane finally reached the bounding ball while inside the penalty area, Kepa tried and failed to knock the ball away and instead clattered into Kane. The head ref then blew his whistle and immediately signaled that he was consulting with the video assistant to decide what to do. But as the two contradictory camera images above demonstrate, the standard of objectivity VAR feigns to achieve is in fact illusory, or at the very least is beyond the reach of the current system. The angle of Chelsea’s video of the incident is probably the better one, but it isn’t the perfect one, and it would take a perfect angle to make an objectively accurate offside decision even possible. Then you have the problem of selecting the right frame, the exact moment the ball goes from touching Alderweireld’s boot to no longer touching it, which is similarly impossible to nail down with perfect precision. And in search of the perfect angle and the precise frame, you take up an indeterminate amount of time (in this case about a minute and a half) while everyone—from the players to the coaches to the crowd to the television viewers to even the referees themselves—sits in a state of confusion, completely unaware of what to look at or how to feel or what should happen, while the refs make a call that is not only incorrect, but is worse than incorrect because of its purported infallibility. Even aside from the fact that it looked like VAR made the wrong call when it overturned the line judge’s correct realtime call and ruled Kane onside, what was exponentially worse was that VAR was even able to award Kane a penalty in the first place. When the line judge raised his flag to call Kane offside, that should’ve been the end of the play. In a situation like that the linesman should’ve kept his flag down to allow play to continue and let VAR decide whether Kane was onside or not, but it has to be difficult to ref by two different criteria (the first being to raise your flag when you judge a player offside; the second being to not raise your flag when you judge a player offside but aren’t quite sure) in the snap-judgment world of refereeing, and anyway, more fault lies with the other refs for not adhering to a simple, presumably ironclad principle: If the ref signals a play dead, the play has to be dead! For good! It’s clear that all three Chelsea defenders in Kane’s area believed the play was dead, which is why they stopped chasing after Kane. How on Earth is that allowed to happen without the F.A. and the media and the English soccer-watching public forming a mob that marches to the VAR headquarters and sets it on fire? “To get the benefit is nice but I am unhappy to win the game like this,” he said. “I am pro technology because you cannot stop evolution but we are waiting so long [for the decision] – it is not clear what are the rules. “It was also really important that the linesman stopped running with play – he had a big impact on our defenders. I don’t think English referees are able to use the VAR system. If you are not sure with the system, you have to follow the ball and at the end of the action decide. But he stopped and didn’t follow the ball – for our defenders it was clearly offside. I don’t know about the goalkeeper but sure, the defenders. VAR will be implemented in the Champions League for the first time starting with this season’s knockout rounds, and it is coming to the Premier League at the start of next season. What could possibly go wrong?